The most surprising thing about this band profile you're about to read about Blur is that it's taken me as long as it has to finally write it. They are one of my most favorite bands in the world and probably the only band of the past twenty years that I hold in as high esteem as many of the legends from the 1960s. Let me rephrase that, actually: while many bands of the past twenty to thirty years can stand up to the legends of the 1960s and 1970s, in my opinion Blur are at the top of that heap. Better? My obsessive fandom of Blur is rivaled only by the way I feel about the Beatles, Who, and Kinks although I've spent more time and energy on channeling that love of Blur's music into something constructive than I have for any other band. I certainly didn't spend months and years of research on (insert shameless plug here) writing on two books for a band I don't care much about. For those uninitiated in all things Blur, they are a band from London whose career spans 1988 to the present, although they've been in an on-again-off-again hiatus since 2003 (we'll get into this later on). 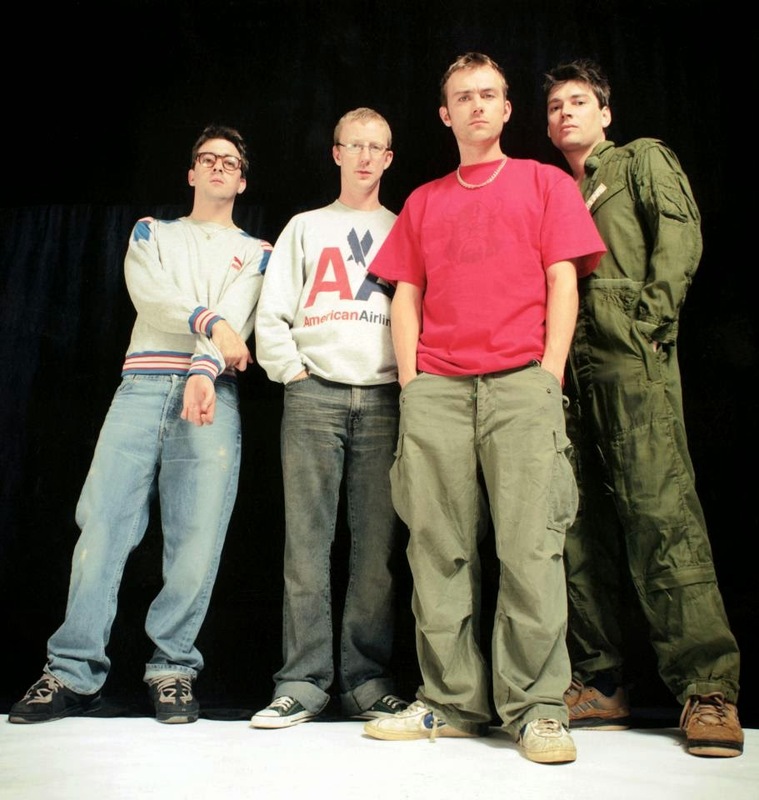 Three of the band, Damon Albarn (vocals, songwriting, piano/keyboards/synthesizers, guitars, melodica), Graham Coxon (lead guitar, vocals), and Dave Rowntree (drums) grew up in Colchester while Alex James (bass guitar) is from Bournemouth. However, it wasn't until Alex and Graham met as classmates at Goldsmiths college that they decided to forma band, bringing Graham's childhood friend Damon and another fellow he'd played in bands with as a teenager (Dave) into the fold. They initially called themselves Seymour and rehearsed in a studio Damon was managing as they built up a repertoire of original material and got to know one another as musicians. Even at this early stage, musically they were a very tight and powerful outfit: Graham would soon emerge as one of the premier guitarists of the 1990s, Alex would emerge as one of the great British bass players of the 1990s with his endlessly inventive and melodically basslines, and Dave as a powerhouse drummer with plenty of chops who always played for the song. The wild card at this early stage was Damon, who was ambitious to the point of overconfidence but struggled to find his voice as a singer and songwriter. Their early material was loud, discordant, dissonant, and played at breakneck speed: a cross between punk, ska, new wave, and noisy Syd Barrett-era Pink Floyd. Graham brought influences like the Who, Beatles, and King Crimson to the table, while Damon was into British Two-Tone ska and new wave. However, while Damon's lyrics at this stage were mostly rubbish, there was (usually) a strong melody lurking beneath the sonic assault. Eventually, via word of mouth from gigging in and around London, they caught the eyes and ears of Dave Balfe and Andy Ross, who owned and operated an indie label called Food Records that had the backing and distribution muscle of EMI Records behind it. Signed to the label in 1990 as Balfe's quest to find "the next Jesus Jones" (anyone my age or older will remember them), the first order of business was for the band, at Food's insistence, to change their name. 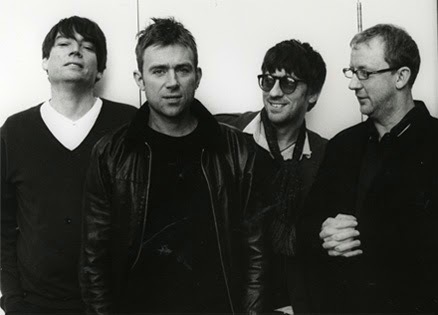 They eventually settled on Blur and began recording their first single, which would be released later in the year. "She's So High" was a simple song with vague lyrics and a repetitive chord sequence, but it was saved by the band's high energy playing, sinewy guitar work from Graham, and the psychedelic and trippy atmosphere of both the song and the accompanying video. The song did respectably in the charts, but it wasn't until their second single, "There's No Other Way," released in 1991, that they had their first breakthrough into the mainstream. The song went top 10 and the band exploded onto the national scene. A debut album, Leisure, was recorded and released in 1991 as well. As far as debuts go it's not bad, but it's very uneven and not a true representation of what Blur would go on to sound like. It suffered on the one hand from too much record company interference (too many producers, Balfe's overbearing presence and personality clashes with Damon which I'll touch on in a bit) while on the other hand, the songs just weren't that good. For each gem like the aforementioned singles, the haunting "Sing," the bouncy and catchy "Bad Day," and the power pop of "Come Together" there was weaker fare like "Fool," the slight (but unfairly maligned) "Bang," and the vapidness of "I Know" and "High Cool." That's not to say I don't like the album...I do, and even the weaker songs have things to redeem them, usually a great bassline or a killer guitar lick. But the overall impact was a far cry from such powerful and fully realized debuts such as those by Blur's two biggest rivals and contemporaries in the 1990s British scene, Suede's self-titled debut from 1993 and Oasis' "Definitely Maybe" in 1994. However, one good thing to come out of this entire experience was the chance to work with former Smiths producer Stephen Street, who would go on to be the George Martin to Blur's Beatles for most of the decade. 1994's Parklife has rightfully been called one of the defining albums of the 1990s and it's easy to hear why even 20 years later. It's a collection of songs that just bristles with energy and defines its era in a way that very few albums manage to do. From the opening sleazy synth-pop blast of "Girls and Boys" to the dark, shadowy, and majestic closer "This is a Low," the album runs the gamut of styles from Kinks-style character sketches to Euro-thrash punk, Beatle-esque melodies, noisy Husker Du power pop and everything in between. Combined with an instantly memorable and eye-catching album cover and superb production from Stephen Street, it marked Blur's ascension to the top of the mountain in British rock and made them megastars. So how do you follow a masterpiece? Blur unleashed The Great Escape in 1995, another #1 album, and after winning a protracted and nasty singles chart battle against Oasis, they were the kings of British rock music. However, the mania surrounding the band nearly tore them apart and in particular led to some immense strain between Damon and Graham. Revisionist reviewing by the UK music press after the initially laudatory reviews of Blur's new album and their tepid reviews of Oasis' new album led to the former album being slated in subsequent years while the latter took on almost mythic status. The truth, as usual, lies somewhere in between. While The Great Escape overall was strong, it took Damon's character sketches to a darker, sneering extreme. Realizing the band's music and cohesion couldn't last if they continued down this path, they spent 1996 reinventing themselves and released what is probably the best album of their career, 1997's self-titled masterpiece. Similar to the White Album, it's a sprawling yet cohesive work that is at times dark, humorous, despairing, and affirming as it covers a range of styles from perfect Beatle-esque rock ("Beetlebum" and "Look Inside America"), Bowie-ish psychedelia ("Strange News From Another Star), noisy thrash ("Song 2," "Chinese Bombs"), trip-hop ("I'm Just a Killer For Your Love," "Death of a Party"), and everything in between. They continued further in this direction with 1999's 13, this time breaking from Stephen Street and working with William Orbit. It's a much dirtier, noisier, and more harrowing album inspired in part by Damon's split from Justine Frischmann after nearly a decade as the premier power couple of 1990s British rock. Pieced together from Damon's demos and long, weird jams the band played in the studio, the album is as emotionally draining to listen to (check out "Battle" or "Caramel") as it was for the band to make, although there are also moments of fun ("Coffee and TV") and beauty ("Tender," "No Distance Left to Run," "Optigan 1"). However, when working on the follow-up in 2002, Graham left the band under mysterious circumstances. The resulting album, Blur's final album which was recorded as a three-piece with Damon taking over guitar duties, was 2003's eclectic Think Tank. Often called a Gorillaz album masquerading as a Blur album and drenched in Damon's ongoing fascination with world music and hip-hop, it's every bit as dark and dense an album as 13, from the uplifting opening track "Ambulance" to the despair of "On the Way to the Club" and the heartache of "Battery In Your Leg" (which is the only album track to feature Graham on guitar). After the tour to promote the album, the band went on a hiatus that, apart from some rumored activity in 2005 that never came to fruition, lasted all the way through Damon's worldwide success as the creative force behind Gorillaz and other various side-projects, until the end of 2008 when Damon and Graham repaired their friendship and got the band back together. From 2009 through 2014, Blur toured around the world (although they inexplicably only played a mere two shows in America, where they have a large and dedicated cult following, including yours truly!) and released three new songs: 2010's one-off single "Fool's Day" on Record Store Day, and 2012's "Under the Westway" backed with "The Puritan." They showed that their live shows were as powerful and that the band were as tight as they ever were (more on their live performances in a bit), and the setlists were a nice cross section of their entire career, including quite a few rarities thrown in on the 2012 and 2013 set lists. However, while there were a few attempts to record a new album (most famously, sessions with William Orbit in early 2012 that ended in a public row in the musical papers, as well as some demo sessions in Hong Kong later in 2013 that came to naught), their final show in Tokyo in early 2014 has been the last we've heard from Blur as a band. Damon has been active, as usual, with an excellent debut solo album and a tour that started in 2014 that shows no signs of slowing down heading into 2015. However, for the foreseeable future (and in my gut feeling), Blur are finished. Besides Damon's solo career, Graham continues to record and release a series of interesting solo albums that he begun in 1998, Dave is a solicitor and radio/club DJ, and Alex is a writer and farmer. I don't make the following comparisons lightly, but there are MANY parallels between Blur and the Beatles. Taking the Beatles' huge impact on pretty much every aspect of Western culture out of the equation and focusing solely on music, the two bands are much more similar than you probably think. As an obsessive fan of both bands, I've spent countless hours pondering these similarities, so here goes. First, both bands consist of four members and only those four members throughout their years of fame. Yes, the Beatles had Stuart Sutcliffe and Pete Best, as well as countless other transient members in their earlier years, while Blur had additional members who came and went before they settled on their classic line-up. But from the moment when both bands began their recording careers and started their career ascension, they both had stable line-ups that never changed. John, Paul, and George all grew up together and were best friends; Ringo, who they got to know years before he joined the band, fit right in and the band became known as a tight unit made up of four distinctive personalities. The same is true for Blur: Damon, Graham, and Dave were friends growing up and when Alex was brought into the fold later, the personalities meshed. Again, a band that looked like (and was) a gang of brothers, all with unique and instantly identifiable personalities. In both bands, every member was integral to their sound and image and each was 100% irreplaceable. Both were led by two dominant creative individuals, although in the Beatles' case it was collaborative (Lennon/McCartney) whereas in Blur there is one songwriter (Albarn) and his lieutenant who helps with arrangements (Coxon). Both bands have rock-solid rhythm sections led by incredibly melodic bass players (McCartney and James) and drummers who have the chops to stretch out when they need to but always play for the song (Starr and Rowntree). The Beatles were obviously more prolific, releasing 13 albums (one of which is a double album) and 14 non-album singles and b-sides over the course of their 8 year recording career, whereas Blur clock in with only 7 albums and 6 non-album singles over the course of their nearly 25 years of existence. However, what both have in common is that they always pushed forward and continually developed and evolved their sound, never releasing an album that sounded like anything before it. While the Beatles' and Blur's closest peers, the Rolling Stones and Oasis, respectively, made many great records and stood neck-and-neck with them in the charts, both had a tendency to not deviate much from their signature sounds. Not so for the Beatles and Blur: while the Beatles obviously made much larger leaps, going from Please Please Me to Revolver/Sgt. Pepper to Abbey Road in a span of 7 years, Blur's jumps from Modern Life is Rubbish/Parklife to Blur to 13 were no less dramatic in the 1990s. Where the two bands differ significantly, however, is when live performances enter the equation. I realize it isn't an entirely fair comparison because the Beatles gigged relentlessly in their pre-fame days and were hampered by being famous during the infancy of the rock concert era, when amplification and PA equipment was woefully inadequate for the enormous venues and audiences they were playing. However, during their fame years, they only toured from 1962-1966 and by the end were only playing 20-30 minute sets that no one (including the band themselves) could hear anyway. By contrast, Blur undertook years of grueling, year-long world tours every year from 1990 to 1997 before scaling back, although their schedules in 1999, 2003, and 2012-13 were no less rigorous. And where the Beatles spent most of their touring years limited by their equipment as to what they could reproduce onstage, Blur were much more adventurous, throwing in a lot of deeper album cuts and b-sides into their set lists over the years. (You can, of course, read all about this in my two books on Blur's live performance history...sorry for the shameless plug but the segue was right there!). As for what Blur's music means to me, they were the first band who were active during my lifetime that I followed absolutely religiously the way I obsessed over the Beatles, devouring every scrap of news and eagerly awaiting every new single and album. There were other bands I followed seriously during their careers while I was a teenager and into my 20s (notably R.E.M.) but I wasn't as fanatical about them the way I was with Blur. I first heard Blur's music without really knowing it in the early to mid 1990s when "There's No Other Way" and "Girls and Boys" were minor hits on the alternative rock and college radio stations I used to listen to. My first real exposure was in late 1996/early 1997 when I heard tracks from their self-titled album (which was released in February 1997) on the radio. "Song 2" and in particular "Beetlebum" just blew me away and led me to buy the album and devour it. Later on that year, my roommate happened to have a copy of The Great Escape that he didn't particularly care for. With that, I was on my way and I've been a rabid fan ever since. My only lament about my fandom is that I wasn't able to somehow be in the UK during all of it, because while they are huge in the UK and also hugely popular in Europe, Asia, and South America, they've always been a cult band here in the USA, darlings of Anglophiles and indie rock lovers in the know and all but ignored by mainstream music and radio. For perspective, while in the UK Damon is first and foremost the lead singer of Blur and Gorillaz is known to be his side project, in America the script is flipped: he's guy behind Gorillaz who also used to be in "that band that did that woo-hoo song." That being said, I am fortunate enough to have seen them in concert, once in 2003, and it was a fantastic show. I had a chance to see Blur in 1999 as well but passed on it due to scheduling conflicts with my exams, a decision I've regretted ever since. I've also seen Gorillaz (2010) and Damon (2014) and in all cases, Damon has proven that he is one of the most talented and diverse musicians of the past 25 years. Blur's music has not only soundtracked most of my life but has led me to write books on them and allowed me to connect with so many people around the world through the online fan community, some of whom I consider true friends (we will meet one day soon!). It's also been really gratifying when I've introduced my friends to their music over the years and converted them into big fans. While many bands have claimed to take up the mantle of the Beatles, I really do think that Blur are the closest anyone has gotten, checking off all of the relevant boxes: stable band membership, unique individual personalities, timeless music, and an ever-changing and developing sound. If you're still skeptical, I hope you'll dig a bit deeper than the overview I've presented here and discover their music for yourself. I bet you won't be disappointed!